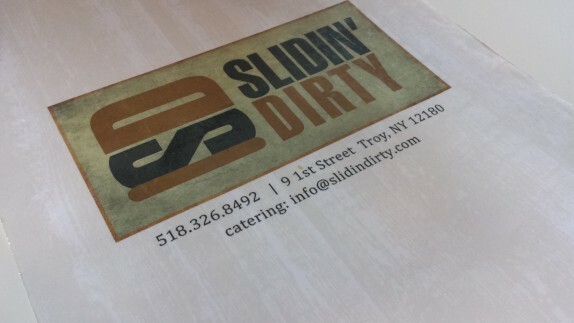 One Wednesday evening, we decided to try out Slidin Dirty’s brick-and-mortar location in Troy (9 1st St). My only experience with the food was a wedding catered by their food truck up in Canton, NY. 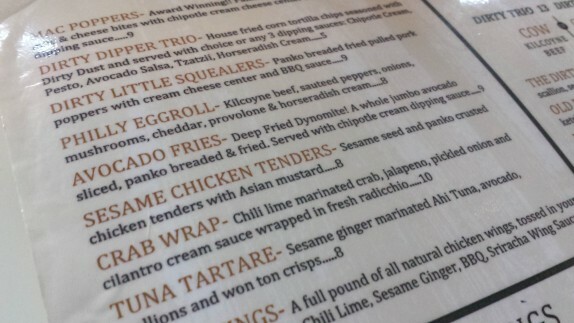 Thinking back, I’m still amazed they were able to cater the whole multi-faceted menu off the truck. It’s rare for me to indulge in fried goodies and burgers during the week, but the course of events leading up to that day were particularly challenging, so we deserved a meal that was above our status quo. We arrived close to 6 pm and were seated immediately. Within a half hour of being seated, the restaurant had completely filled, and there was a line forming at the door. 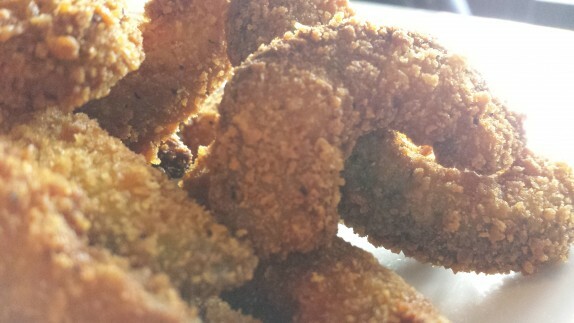 Everyone has been talking about these avocado fries (Deep Fried Dynomite! A whole jumbo avocado sliced, panko breaded & fried. 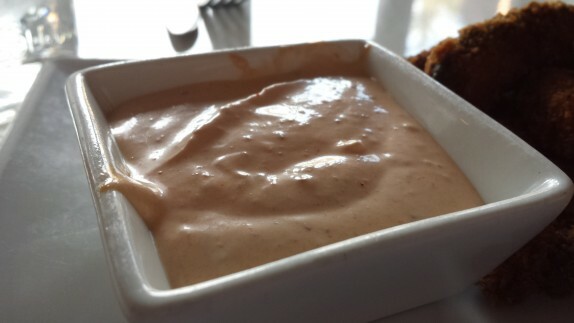 Served with chipotle cream dipping sauce – $9). At the wedding I attended, these were not being served, so I had to finally try them. I went with the full appetizer portion, because I wasn’t going to fool around with the smaller side dish. 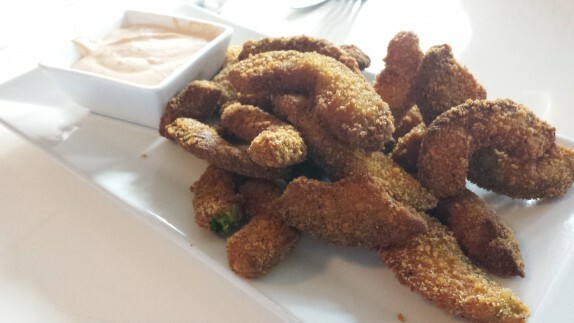 The avocado fries are something special. The panko breading was packed onto each thin slice of avocado. 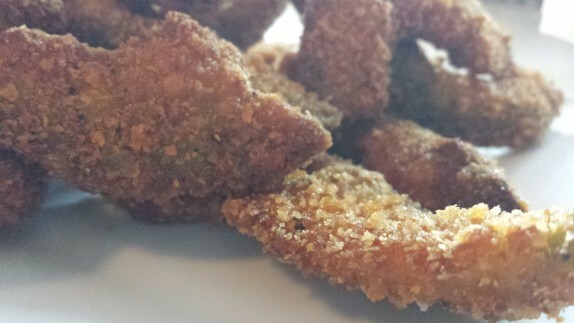 They’re fried crisp to a point where it is astonishing that the avocado hadn’t melted away. Even though they contain avocado, these aren’t healthy by any stretch, so if you’re looking for a healthy treat, buy nonfat yogurt. The dipping sauce was good, but didn’t really add much, in all honesty. If one thing could make these better, it would have been some seasoning on the crusts as they were removed from the fryer. Looking around the restaurant, they have lots of little pieces of artwork promoting their local values. The one particular sign that caught my eye was their dedication to using beef from Kilcoyne Farms. I have quite a bit of experience with this particular meat, as I’ve cooked it and have tasted it featured in multiple burgers at local restaurants. 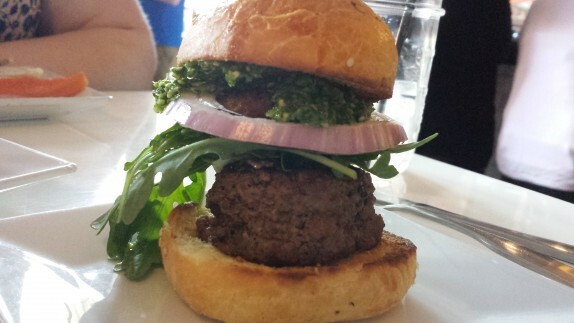 It is a beef that is extremely tasty but not terribly forgiving if you overcook it. 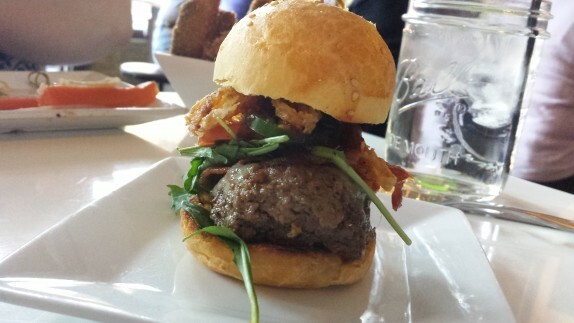 I was eating big that day, so I went for a “Dirty Trio” ($13), where I could pick three of their slider creations with either beef, chicken, or black bean patties. In all three, the beef was well done, so it lacked the juiciness I associate with Kilcoyne beef. The patties were well seasoned and the flavor was all there, but they were a little dry. That surprised me because the patties were so tall and didn’t fill the cross-sectional area of the buns; usually with a thicker patty, it’s easier to get done medium. With The Soprano, chicken would be a much better accompaniment, as the beef really overpowered the other toppings. Honestly, I had forgotten there was mozzarella on there until I was almost finished with it. That’s on me, though. My fried egg on The Hangover came pierced by a skewer, which was slightly annoying as the yolk leaked onto the plate and soaked into the other two. 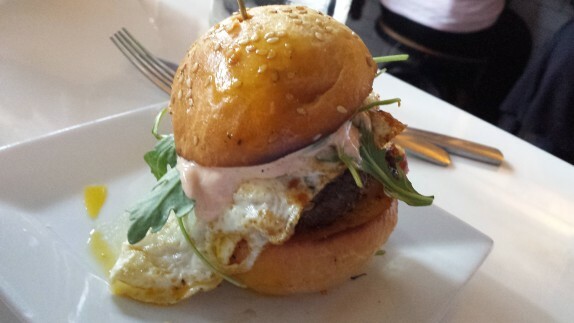 This one was probably my favorite, as it has everything to love about a breakfast sandwich plus beef. Composition-wise, it was perfect as I ordered it. 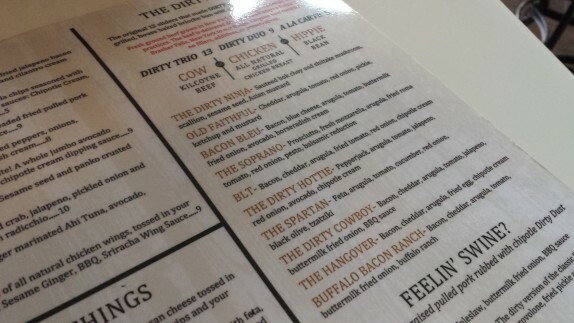 The Dirty Cowboy was pretty good. It might have benefited from a little more BBQ sauce, but it stands to reason that a better cooked burger patty might also be the solution. I could see this combination of toppings also working with the chicken option. In fact, it may even be better (I’m imagining BBQ chicken). The buns were very good, and were a vast improvement from what they were using when I had sliders off the truck at that wedding. 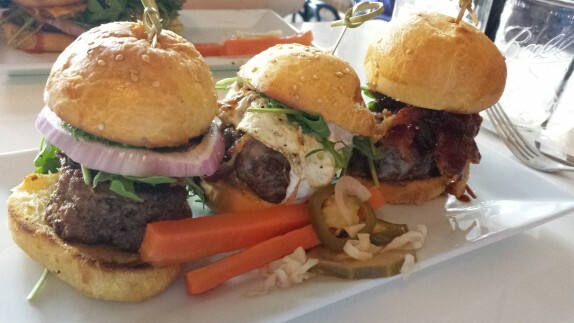 A few pieces of pickled veggies were presented along with the sliders. Those vinegary bites helped cut through the richness of the beef and toppings. All-in-all, our experience was very positive at the Slidin Dirty Restaurant. In fact, it’s a pretty neat space. It has a really casual and modern feel without pretentiousness, so it’s the perfect place to meet up with some friends and chow down or grab some drinks (the bar menu looked pretty interesting, but I wasn’t interested in drinking that night). I’ve been there two times now. Each time, the food is good but the service is lacking. On the last visit, the server never came around to check on how everything was, which was unfortunate because we were ready to order another round of drinks. We wound up going for cocktails at The Shop afterward. The well-doneness of the meat bothers me a little too.